The Agents of Mystery are here! 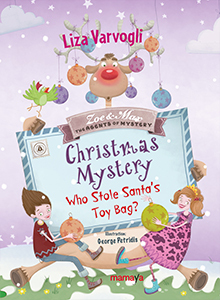 This time they must travel to the North Pole in order to solve a new mystery. Someone stole Santa’s toy bag and he cannot carry the toys in order to bring them to children all over the world. Who stole Santa’s toy bag? Who is the person who doesn’t want the children to get their Christmas presents? It’s a mystery! Mystery Agents Zoe and Max are here to solve this new mystery with the power of their brains and their kindness.